I am not a "luxury traveler" by any means. While I treat myself to cake pops and chai lattes whenever possible, spending extra money to fly first class had never crossed my mind. So I was super excited when my sister, Katie, won first-class Delta tickets to *anywhere in the United States* and invited *me* of all people with her. In order to make the most of her winnings, we decided to travel as far as we possibly could on them, which meant Hawaii. I've already written about how wonderful our trip to Hawaii was, and knowing we were going for free made it even more fun to plan our helicopter ride, boat tour, hike, trek the see the sunrise on top of a volcano, and our meals. Flying with vouchers meant that not every flight was available to us, so my flight schedule was JFK to Atlanta to LAX to Kauai. Katie was flying from Philly to Atlanta, which is where we met up. 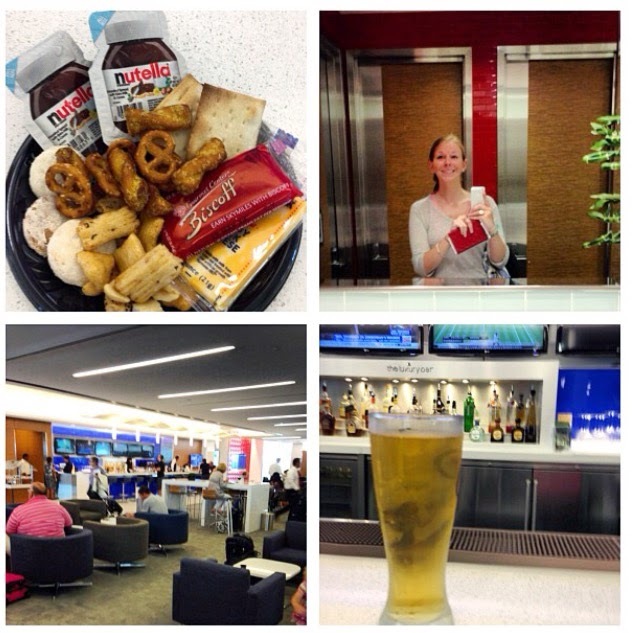 At JFK I was able to take advantage of the Delta Sky Club, the first-class lounge. I also enjoyed the Sky Club when I flew to Italy because at that time I held Gold Status with Delta and my first stop was international. The Delta Sky Club is incredible and makes you feel like you're a princess. Free drinks, free snacks galore, wifi, charging stations, comfy chairs, nice bathrooms, and more - all away from the normal hustle and bustle of the rest of the airport. If I ever have access to the first-class lounge again, I may go to the airport a whole week early. On our flight from Atlanta to LAX, a gentleman boarded right before me. I heard someone call out "Luda!" and I turned to Katie and said, "I think that might be Ludacris..." (the rapper) but she gave me a look of "Yeah, right" as we were just facing his back. I said, "He's got Louis Vuitton luggage and he's flying first class and he lives in Atlanta." She was convinced when we boarded the plane and saw him sitting just two rows ahead of us. The number of people who passed him and took photos without his permission was astonishing. I hope that when I'm famous people leave me alone when I fly so that I can focus on my crossword puzzles. Katie and I shared a flight back from Hawaii to LAX but then I flew direct back to NYC, whereas she had to go back to Atlanta to get to Philly. This was my favorite flight because I had the option of sitting in Business Elite, which is better than first class. In Business Elite, you basically get an entire pod to yourself. The seat reclines all the way back, you have a down comforter and pillow, an amenities kit, and more. I also watched Frozen for the first time on this flight, which I probably should have watched before our sisters trip rather than afterward. Because I was in my own little world in my Business Elite pod, I didn't feel weird about sobbing hysterically throughout the movie. Much to my delight, I was upgraded to first class on the rest of my flights in 2014, a long weekend with the family in Montreal (where I ate some awesome breakfasts and one extra-adorable lunch) and a quick day trip to Buffalo (where I indulged at the number one restaurant in the city). I tried to casually make my way into the Delta Sky Club at LGA when I went to Montreal, but I was denied. It seems as if it's not permissible if you've just been upgraded instead of having a voucher or being Gold Status or above. I loved my experiences flying first class and got quite used to it with nine flights in a row, but I was *not* upgraded on my trip to Charleston in January and was forced to sit in coach. At least I got to sit with my cousins Emily and Christie who I wouldn't have been able to gab with if I'd been upgraded. The flight was still great and full of giggles. With that said, Delta, if you'd like to upgrade me on the way to Lisbon or on the way back from Barcelona, I am SO FOR IT.